RIM CEO, Thorsten Heins has confirmed the company will continue to produce both touchscreen and physical keyboard options. During his keynote talk yesterday, Heins revealed the new touchscreen keyboard technology set to feature in the upcoming BB10 platform. This led to some wondering if the firm synonymous with physical buttons was about to ditch them in favour of a solely on-screen experience. Speaking to members of the press in a dedicated session today, Heins made the situation crystal clear - RIM will continue to offer both physical and on-screen keyboard options. 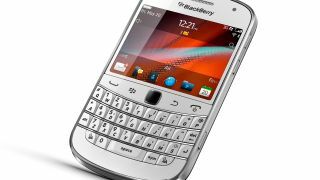 Heins said: "We want the typing experience on a BlackBerry to be the best in the world, be it a physical keypad or a touchscreen. "Just to be really clear, we have the best physical keypad on the planet and we don't want to give this up, as there're still people out there who love the hardware reaction of a physical keypad." This will come as welcome reassurance to die-hard BlackBerry fans, who class the physical keypad as a key feature when purchasing a phone. Is RIM right to continue offering physical keypads, or does it make the company look out-dated as the competition move towards touchscreen only solutions? Let us know in the comment box below.